Thank you to Tide and Circle of Moms for sponsoring this post. Raise your hand if you are head over heels in love with Fall like I am! Leaves, blankets, baking, apples, pumpkins…I love it all. I know I am not alone in that. One of my favorite parts of Fall is college football. (Does that surprise you or would you have guessed that?) In the Fall we take the kids and go over to Great Grandma’s house to watch our favorite team play. Can I just tell you that there are few things I love as much in this world as watching football with my husband’s Grandma? Seriously, I love it. And Grandma always puts out a big spread. I’ve already shared Grandma’s Famous Chip Dip with you. It’s a must have at our football parties. 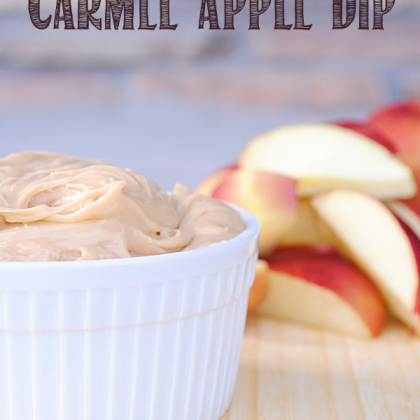 Today I am sharing a super easy, four ingredient caramel apple dip recipe that you can make for your football parties. Did you hear that? Only 4 ingredients. And you are going to be surprised to hear what they are. When I made this dip this week, my 5 year old and 2 year old gathered around and dug in. You can guess that that gets messy with little sticky hands. Football parties with Grandma can get messy too when she’s got popcorn, candy, dips and all that yummy stuff. No worries. I use Tide to clean their clothes up nicely. Do things get messy around your house in the fall football season? I’m thinking sports uniforms with grass stains (hello!) and mud puddles, not to mention traditional fall activities like pumpkin carving, jumping in leaves, hay rides. These things get messy! Tide with Febreeze is here to help you too. Once the cream cheese is very softened, combine all ingredients. Stir vigorously with a fork or use a mixer to combine. Stir until it is smooth-no lumps! This stuff is amazing! 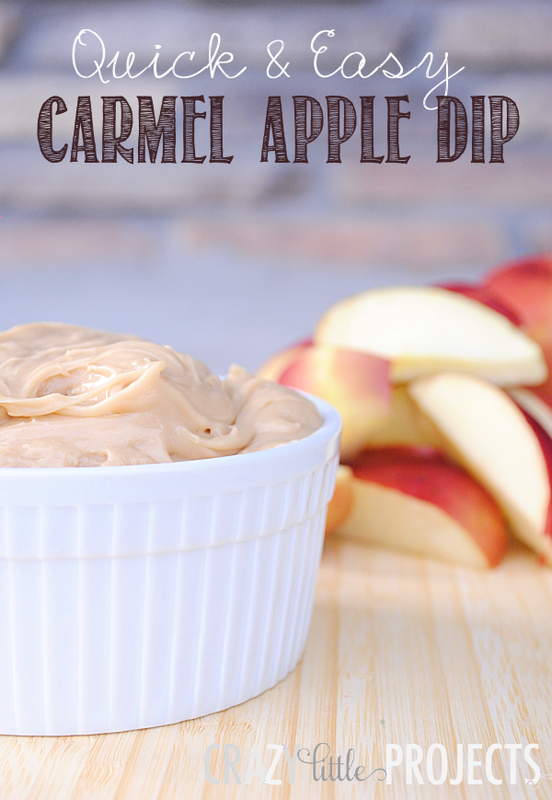 And let’s be honest, the apples are really just a vehicle to get the caramel into your mouth. This post was sponsored by Tide through their partnership with Circle of Moms. While I was compensated to write a post about Tide Plus Febreze Freshness Sport, all opinions are my own. what interesting ingredients. I will have to give this a try. I really like all the seasons except winter and drag on after the first of the year! lol we married in october and it was a beautiful ti. we went to vermont for our honey moon and it wsa so beautiful all the trees were showing their best colors. thanks for the recipe and I think it is wonderful that you go to great grandma’s house to watch football. sounds like a wonderful memory in the making for your kids! Mmm…this is a go to recipe at my house, everyone Loves it! Try adding a bag of Heath bits to the mix, then using all Brown sugar to take it Over The Top! Yummmmm! I’m keen to give this a go. Sounds like a really simple idea for a little finger food for unexpected visitors too. 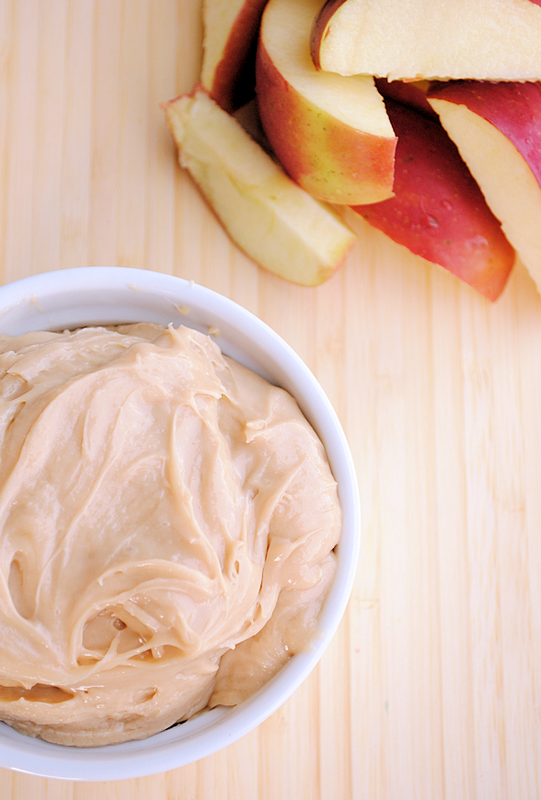 And yes, the apples are just there in place of finger to scoop up the dip! I just made this dip for my family and it’s a big hit. It was super easy to make. I dumped the ingredients in a bowl and my 6 year old son mixed it while I sliced apples. Thanks so much for sharing. Hi! This sounds yummy! I’m assuming you are speaking of granulated white sugar, not powdered right? I made this recipe and paired with delicious chips using pizza crusts I love the sweetness of both together! How many does one recipe serve? I want to do it for a church function, and it looks delicious. Oh that’s a good question-It’s going to make about 2 C worth of dip-how many it serves is hard to say!